No riding on dikes today the initial one was blocked off for resurfacing as in fact the road diversion was too. I guess the Hungarian tarmac manufacturers must be coining it in! I did a little side trip to the battlefield of the so called disaster of Mohacs where Hungary fell to The Turks and got divided up in 1526 – 487 years ago & apparently they have never recovered from the defeat. It was well over 3 pints of beer in price to go in. So I declined and pedalled on.. The customs post with Croatia was a half hearted affair with only a cursory inspection, hardly surprising since they only joined the EU two months ago. Interestingly Croatia’s official name is Republika Hruatska (make a good pub quiz question). You soon start seeing the devasation caused by the civil war 20 years ago with many ruined buildings and memorial stones outside each village. After climbing over the vine covered hill near Batina and its interesting cave entrances I briefly met up with the French Tandem couple again. Beatrice is keeping a blog that can be found by clicking here. in French of course. I particularly like the traditional house design. Built at right angles to the road with a veranda the full length of the house. In summer you can sit under it & in the winter store your logs. 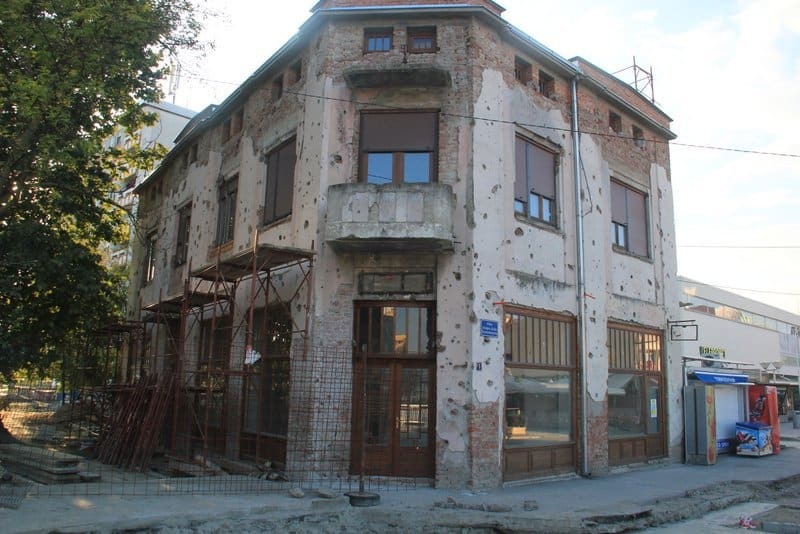 The real shock of the day was entering Vukovar which still looks war ravaged from the civil war and its 87 day siege in 1991 where the Serbs basically flattened the city including massacring 6 bus loads of patients & staff from the hospital which they had already heavily shelled & bombed . Truly amazing mans inhumanity to man and only 22 years ago. The situation is currently made worse by the authorities tearing up all the streets in the mania that is sweeping Europe to repave all cities, villages etc to dubious benefit, Since if you look anywhere this has been done the streets are in a terrible mess a few years later. Well in fact today I only got to see The Danube at the start & finish both from my bedroom window :-). I did the best part of 80 miles and now not too far from Belgrade. I’m spending today exploring the horrors of war by visiting the Place of Memory in the rebuilt hospital’s basement. I purchased the DVD containing news clips & commentary of the horrors. Previous PostDunapataj to Mohàcs on The Danube Bike TrailNext PostDanube Bike Ride from Vukovar the brave to Novi Sad the shellsuit. Go Geoff! I didn’t know the Danube went near Croatia (Hvratska). The Croatians got all the nice coastline out of the old Yugoslavia. can I ask a technical question: how do you get the pics of you? Passers by? Self-timer? or a bit of both?